Bayshore HealthCare is an organization full of heart. We’re committed to community care, and strongly believe in the benefits that come with local leadership. Bayshore is here to provide care to all Canadians regardless of age, and we show care for our community in ways beyond health care. In the spirit of storytelling, we’d like to share experiences our branches have had with clients and community organizations to demonstrate the difference Bayshore makes in local communities. Ottawa, ON: The Ottawa Private branch organized their first charitable donation, choosing to participate in support of the Ottawa Food Bank’s Baby Supply Cupboard. In two short days, the Ottawa Private Branch came together to donate 14 pounds of baby supplies including food, wipes, diapers and formula. Fredericton, NB: Aaron Hatty, our Fredericton branch MCP, donates annually to a local women’s homeless shelter. Last summer, when a client of our Fredericton branch needed clothing, Aaron contacted the women’s shelter that she donates to and they were able to send her clothes and toiletries for the client to use. In awe of the support that they received from the shelter, our team orchestrated their own fundraising initiative to raise socks (91 pairs in total) and toiletries to give back to the same shelter. Aaron and her team urge others to donate whatever they can to homeless shelters; socks and various items are always in need. Thunder Bay, ON: The Thunder Bay branch was notified that one of their diabetic clients had run out of food and test strips. With no one else available to bring these items to the client, our team jumped at the opportunity to make a difference by arranging to have a box of test strips and a month’s worth of groceries delivered – free of charge. 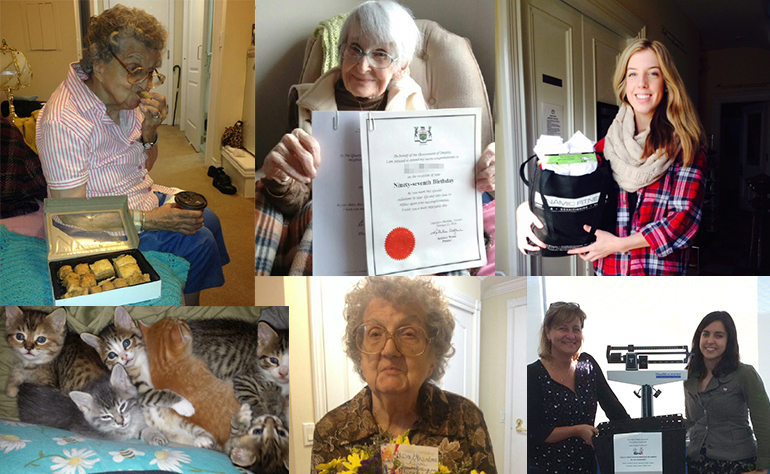 Orillia, ON: A client from Orillia, who recently passed away, shared a special bond with her former caregiver. On the client’s 96th birthday, the caregiver had a pizza delivered with all of her client’s favourite toppings. This act of kindness proves that in the case of this caregiver and client, working for Bayshore is more than a job – it’s a place where meaningful connections are made. Ottawa, ON: On November 11, 2015, our Ottawa Government Branch planned a special delivery to our private paying war veterans as our way of saying “thanks for all you’ve done”. Fresh baked goods were delivered to three exceptional veterans ranging from 93 to 99 years of age. This initiative was a wonderful way to add a personal touch to our care process. St. Catherine’s, ON: The oldest female client on service at the St. Catherine’s branch recently celebrated her 97th birthday. To ring in this milestone in style, Bayshore contacted the Premier of Ontario & Lieutenant Governor of Ontario’s office to request a congratulatory message. The certificate arrived a week later, and was presented to our pre-centenarian client for her to proudly display in her home. These stories are only a sample of the many passionate and caring acts carried out by our branches on a local level. We deliver the unique Bayshore Healthcare experience built on the principles of Compassion, Respect, Reliability, Patience, Professionalism, Ethics, as well as Continuous Learning and Improvement. Looking for compassionate care in your local community? Visit our locations page here.